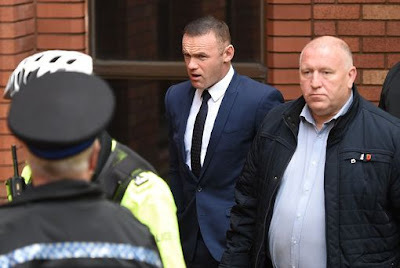 Former England footballer Wayne Rooney has pleaded guilty to drink-driving in court. He was wearing his wedding ring when he arrived at court to face the charge that has put his marriage in crisis. 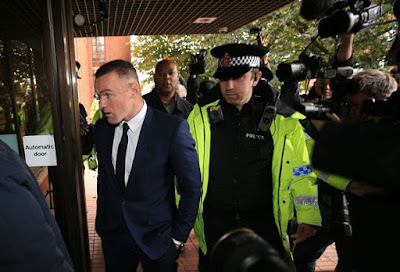 The Everton striker, 31, was wearing a dark suit and had his hands in his pockets as he walked past journalists with about a dozen police officers and two security guards surrounding him. There were shouts of "put him in handcuffs" from a crowd that included football fans and onlookers (talk about major haters). Recall he was arrested at the wheel of party girl Laura Simpson’s Volkswagen Beetle convertible earlier this month. Rooney met Simpson, 29, in a bar on a night out with friends and left driving her car. Simpson is now milking on the incident and attending every even she can with photog all over her. Story still devloping because he is still in court! Oh poor Rooney!